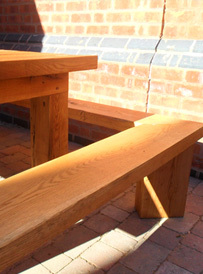 After working with oak sleepers during the past few years, we realised its beauty, rustic qualities and pure solidity. As a result, we decided we wanted to work more and further develop products using this material. 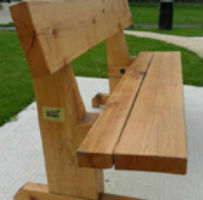 We have now produced a line of outdoor rustic solid oak furniture which promotes the unique and special qualities of this wood. 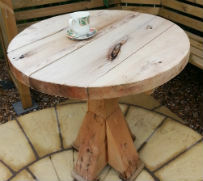 Please click on the Solid Rustic Oak outdoor furniture for sale tab on the home page to take a look. The oak we use is all certified, meaning it comes from responsibly managed forests. It has usually been seasoning for two to six months before it is used and as such will have a level of moisture content. It will continue to season for up to two years depending on the environment it is in. During this time - mainly the first year, there will be an amount of splitting and cracking that will naturally take place within the timber as it seasons. The design and construction of the furniture has been carried out with this in mind, and any splitting and moving should only change the piece to visibly enhance its aesthetic value, and not affect its structural integrity in any way. We are so confident in the products structure, every piece comes with a two year guarantee. Please click on the icon for details. 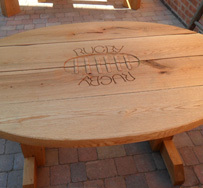 All items are available as seen and can be produced in bespoke sizes. 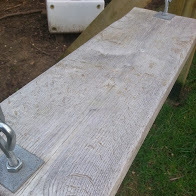 Items can also be produced to allow for wheelchair access as required. If you have any designs or ideas of your own, we are more than happy to discuss them with you. All the items have been finished with several coats of anti-fungal preservative . 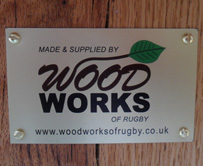 Other finishes are available including stains and varnishes and we can offer advice as to what it best for your particular item. Samples are available on request. Colouration will change as each piece ages. Generally the oak should obtain a slight silvery tone with the grain darkening slightly. As the years progress, regular treatment should ensure it grows old gracefully. 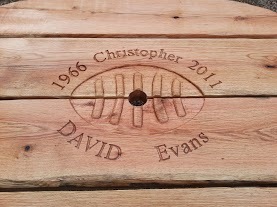 Additionally, carving of letters or emblems in various fonts into any piece of furniture is available to suit your needs, making these pieces ideal for memorial benches, sporting clubs or any other organisation that would like a personal touch. Next to the picture of each item there is a standard size and price for the piece shown. This will give you a cost for that piece. However sizes can be made to suit your requirements, so why not contact us with your specifics in order that we can give you an accurate price. Prices also include the anti-fungal finish. Items can be delivered within a local radius by van - with free delivery in the Rugby area. Alternatively carriage costs are extra and will be quoted for as per requirements. If installation is required, again we are happy to provide a quote. Each piece is supplied with a duty of care, and as long as the instructions are followed you can look forward to a lifetime of use and appreciation.